Hydro-Québec and several partners on Thursday submitted six separate proposals to meet Massachusetts’ call for 9.45 TWh a year of renewable generation, with one proposal alone meeting nearly the entire energy requirement. The solicitation is a collaborative effort by the Massachusetts Department of Energy Resources and the state’s distribution utilities: Eversource Energy, National Grid and Unitil. Projects will be selected next January, with contracts to be submitted in late April. Hydro-Québec partnered separately with Eversource, Avangrid and TDI New England on three different transmission projects, and has agreements with Boralex and Gaz Métro to add wind power into the energy mix on each project at the state’s request. 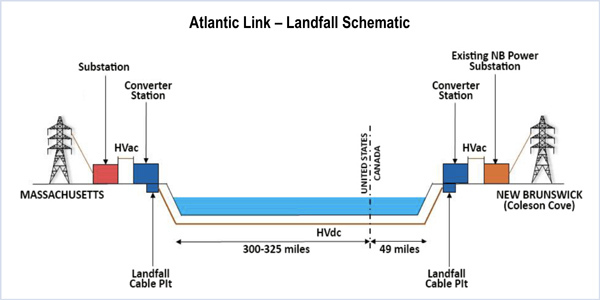 Nova Scotia-based Emera proposed the Atlantic Link project, a 375-mile submarine HVDC transmission line extending from New Brunswick to Plymouth, Mass., near the retiring Pilgrim nuclear plant and close to the Boston load center. The project would become operational in December 2022 and deliver 5.69 TWh of clean energy per year to Massachusetts at a fixed price for 20 years. Energy prices were not disclosed for any of the projects. National Grid partnered with Citizens Energy on two proposed projects. The Granite State Power Link, a 59-mile, 345-kV, HVDC transmission line from northern Vermont to New Hampshire, would deliver 1,200 MW of new wind power from Canada. The companies’ Northeast Renewable Link is a 23-mile AC line from Nassau, N.Y., to Hinsdale, Mass., designed to deliver 600 MW of new wind, solar and small hydro into the New England grid. 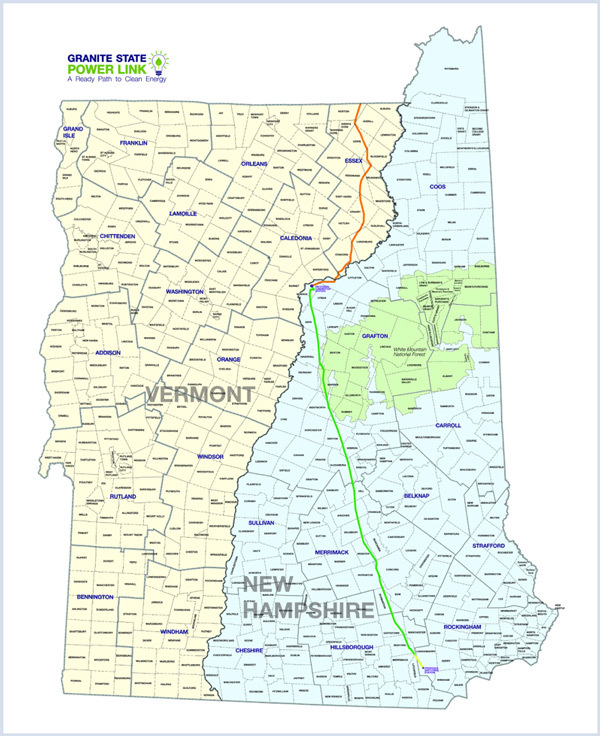 Eversource has partnered with Hydro-Québec on Northern Pass, a 192-mile line that would carry 1,090 MW of hydropower to New England — up to 9.4 TWh per year for a period of 20 years starting in December 2020. Avangrid submitted several proposals Thursday, some wholly owned by the company and others joint partnerships, but it did not release a list. Its subsidiary, Central Maine Power, is partnered with Hydro-Québec on the New England Clean Energy Connect, a 145-mile, 320-kV HVDC line that would carry 1,200 MW of hydro and wind energy from Canada to Maine. Avangrid CEO James P. Torgerson told analysts last week that his company plans to bid multiple transmission and renewable solutions into the solicitation. “They’re looking for incremental hydro on a firm basis but also new Class I renewable portfolio standard, which would be wind and solar. A combination of both could include transmission projects under a FERC tariff,” he said. Hydro-Québec has also linked up with TDI New England on the New England Clean Power Link, a 154-mile underwater and underground transmission line that would transmit 1,000 MW of Canadian hydropower under Lake Champlain to Vermont. The Energy Department recommended approval of a presidential permit for the New England Clean Power Link. The Massachusetts Department of Public Utilities rejected fees National Grid sought to impose on small commercial and industrial customers that own distributed energy resources.